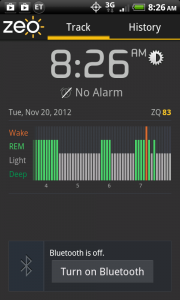 I decided to undertake this project after purchasing a Groupon for the Zeo Sleep Manager Pro+. This is a headband that tracks sleep stages via muscle movements or brain activity (I do not know which, for sure). It also features a nifty little API that other Android apps can interface with. That removed the need for any shifty business on my part involving rooting my phone and hijacking their database while it was in use. I also had a spare bluetooth headset that was sitting around, so I decided to combine them all into a pair of completely wireless lucid dreaming goggles. My device differs from most of the other devices out there, because it is all tied together with a computer- my HTC Incredible Android phone. The Zeo Sleep Manager lets me track nuanced sleep stages (not just the presence of REM sleep, like some goggles that use IR detectors), the Android app gives me a fine granularity of control over the type of signal that is displayed by the goggles, and finally the bluetooth receiver makes this whole project wireless- and easier to sleep with, without having to worry about choking yourself with wires. 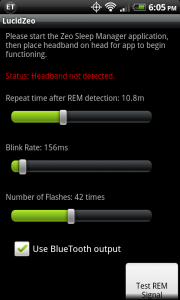 The sleep data is obtained using the Zeo headband. My own app then takes that data and looks for a nice few-minute chunk of REM sleep, then generates an audio alert to user specifications. Instead of porting the alert through the speakers and likely waking me up, I pushed the sound to the bluetooth headset (which has had its speaker neutered). The audio signal is amplified by an op-amp circuit, which acts as a glorified light switch, turning on the LEDs in the mask. 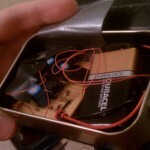 I also took out the ~4v LiIon battery from the headset, and used a step-down voltage regulator to let it sip off the 9v battery. Part D24V6AHV, from Pololu. 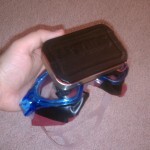 I shoved all of this in a “project box”… you may recognize it as an Altoids tin. 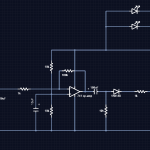 Here is the schematic, a modified version of this. If you want to create one of these, and leave out the bluetooth part, you can also simply plug a headphone cord into your phone, and wire that to the audio input of the circuit, it should work the same way. I tried a number of widgets available on the Android marketplace that supposedly ported all sound to a bluetooth device, but they either failed or only worked for an hour or so. I just decided to program my own bluetooth interface, which was surprisingly simple (I think it only took maybe 10 lines of code, and a few minutes of debugging). This is a screenshot of the Zeo Manager app, after a successful night of using the goggles. 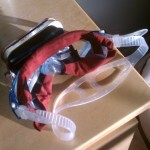 The red line indicating wakefulness may have been the point where I was lucid, as triggered by my goggles. I will need to test that further. The app, LucidZeo, is available for download on my site. And the source code/Eclipse project file is available here. The application doesn’t serve much purpose without the hardware, however. In an ideal world, the amplification circuit wouldn’t be necessary, but my phone simply doesn’t put out enough voltage through the headphone jack to drive these LEDs directly. It’s important to note that this is only one step towards a lucid dream. You must still realize that the flashing lights signify that you are dreaming. And sometimes, your brain can work them into the dream in an inconspicuous manner, like flashing police lights. There are other pitfalls, including false awakenings, in which you think you have been woken up by the flashing lights, but are really still dreaming. It also helps to perform reality checks during the day, when you see flashing lights. The flashing lights essentially become a dream sign that (with the help of these goggles) are more likely to appear. This entry was posted in Android, Java. Bookmark the permalink. Post a comment or leave a trackback: Trackback URL.